My Aunt Jenny and Uncle Jim have been making this pork loin for a number of years now. They have made it for us a few times and every time it has been delicious! We even had it for Christmas dinner one year. With the meat going on the grill, you can fill the oven with fabulous sides! You can very easily alter the flavor of this pork by changing what what seasonings you use. Just follow the directions for cooking and you will have tender and moist pork loin every time! Just look at all of that bacon. It has to be good! Soak skewers or toothpicks in water. Generously coat loin with seasonings/rub of your choice. Take strips of raw bacon and wrap around the circumference of the loin and secure with skewers or toothpicks. Leave about a slice of bacon's width between the bacon strips. Apply more rub to cover the loin and bacon. Sear over high heat (direct flame) on both sides on grill. Turn off one side of the grill and bring the other down to a medium flame. Cook over indirect heat (keep meat on the side that is off) for 45 minutes then flip over. Cook another 45 minutes still over indirect heat. Remove from grill and tent with foil for at least 10 minutes. Bacon wrapped anything only makes it more delicious. 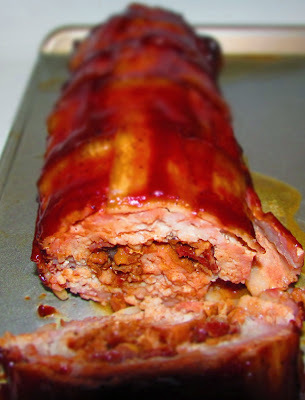 This bacon wrapped pork loin looks fantastic! I agree, bacon always makes it better! Thanks you! This looks so delicious. A pork loin when cooked correctly s my favorite meat! Thanks for linkng it! Thank you! I love a good pork loin too. It is easy to dry it out though! Thanks for stopping by! Yum! This sounds so good. I love anything wrapped in bacon. Thanks for sharing at Inspiration Thursday! Have a great week! Me too! Bacon can go in, on or around almost any food and make it better! Thank you so much for hosting. Enjoy your weekend! Thank you! It is soooo good! We do love a good pork loin and bacon makes everything better! Yum! You are right, it is hard to go wrong with bacon! Thank you, it is definitely a family favorite! Thank you so much, it is a real winner! See you tomorrow! Oh, man, does this look so delicious! We love pork, too. I will try this recipe. Thanks for sharing with us at Funtastic Friday. We love it every time we have it and hope you do too! Thanks for hosting! You always get me with the bacon recipes! I love smoking pork loins but I've never put bacon around them. I'll have to try this sometime soon! I can't help it, everything is better with bacon! ;-) We love pork loins too. I have been loving them stuffed, but this is still one of our all time favorites! 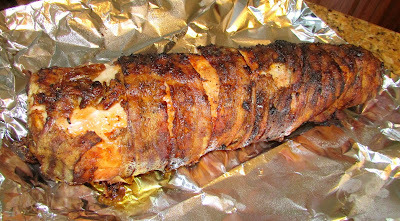 What a delicious Grilled Pork Loin! We always enjoy your post at Full Plate Thursday and thanks so much for sharing them with us. Hope you have a great week and come back soon! It is always so good! Thanks so much for hosting, I always enjoy seeing what you are filling your plate with! This looks yummy!! I love pork!! Looks good!! Thanks for sharing on My 2 Favorite Things on Thursday - Link Party!! Hope to see you again this week!! I pin everything on my 2 favorite things pinterest board!! I love pork too! This is definitely one of our favorite ways to have pork loin! This looks yummy! Thanks for sharing at the Merry Monday Link Party! 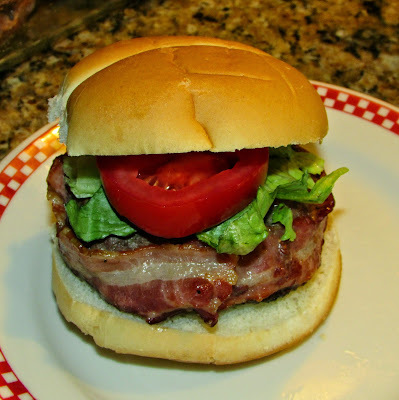 Another great grill recipe and I am so glad you shared with Inspiration Thursday! I can't wait to make it on my new grill. Have a great week! This is always a favorite when we make it. I hope you love it! OH, this looks absolutely divine and I can cook it on the grill, too! Thanks for linking up to the Country Fair Blog Party this month. Thanks for stopping by! 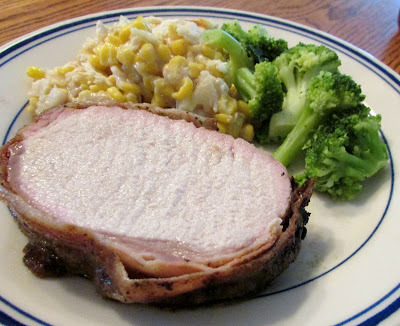 This is one of our favorite ways to have pork loin, I hope you enjoy it! This looks truly mouth-watering. We cannot wait to move so we can start grilling again. Pinning for then! Thanks, Michele! There really is just something special about grilled meat! I make a similar version using pork tenderloin. This may be better for serving a larger number of people. Tenderloin would be a great way to do it for a smaller group!